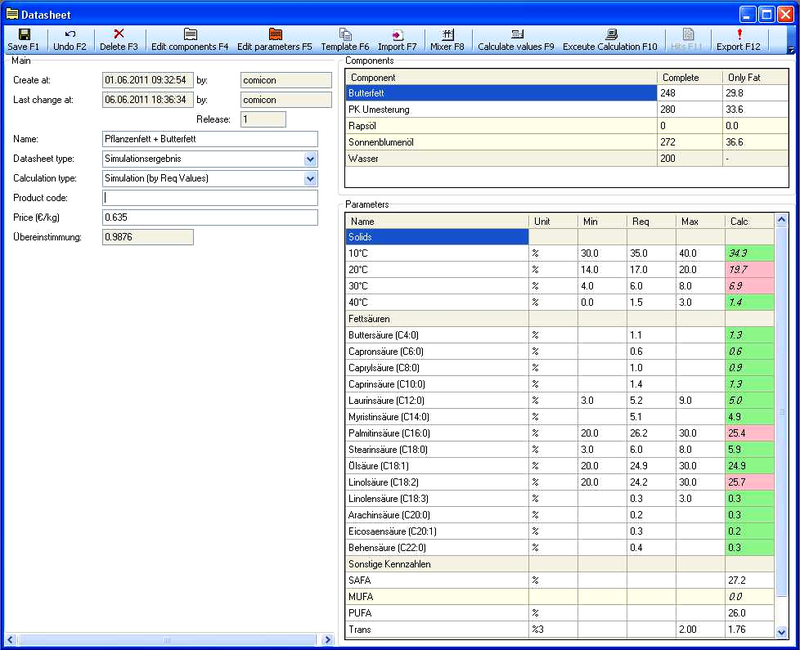 The OilExpert.net software is used by oil chemists and analysts to calculate, simulate and optimize fat blends and interestifications on the desktop. One of the most important features is it's ability to calculate the solid fat content (SFC) taking into account the solubility of liquid oils and fats such as coconut or palmkernel oil and the eutectic behavior of oils and fats. OilExpert.net has numerous standard components as well as their analytical values and parameters e.g. SFC values, solubilty data, fatty acids, sterols, tocopherols, etc. but they can also be expanded through input of your own data and your special components. Calculation and reevaluation of customer's specifications - quick and easy. Simulation and construction of new fat compositions on the desktop. Price-optimization of fat compositions with consideration of all analytical values and parameters. Price optimization of raw materials. Recalculation of fat compositions. Calculate one or more possible fat compositions from analytical values. Calculation of the SFC values of interestifications starting from fat composition. Raw material history with full access and usage of historic data. Raw material management with selection of different raw material to Business Units/Regions, Countries and Production sites. User management depending on Business Units/Regions, Countries and Production sites. Import of raw materials, daily raw material prices and blends. From now on a demo version is available with full functionality. This version is six months runnable and can be extended if necessary. If interested, please send us an email to info@oil-expert.net or call us.